Air Board Specification N.1B of April 1917 covered a number of naval requirements in single-engine, single-seat aircraft, one of which was to be a torpedo carrier, intended in due course to replace the Cuckoo. The Specification outlining the requirements for the latter was amended several times, and in October 1917 called for the aircraft to be capable of carrying the Mark VIII torpedo, a 1,436 lb weapon that possessed a warhead 50 per cent larger than that of the Mark IX. Both Short Bros and Blackburn submitted tenders, and each company was invited to build three prototypes. Little time was allowed before the first prototypes were required for preliminary Service evaluation, and both manufacturers made tremendous efforts to meet the deadline set for the end of April 1918. The Short aircraft, named the Shirl (N110-N112), was of simple configuration, owing much to Oswald Short's N.2B seaplane, but with the single cockpit situated in much the same position as the observer's cockpit in the earlier aircraft. As permitted in the Contracts, power was provided by the 375hp Rolls-Royce Eagle VIII driving a two-blade propeller and being neatly cow led with frontal radiator. The broad-chord wings of equal span and with square tips were rigged without stagger, being foldable and with ailerons on upper and lower wings. An unusual requirement, partly occasioned by delays in the completion of HMS Eagle, was that the wheel landing gear was to be jettisonable so as to simplify ditching if the need arose, and flotation gear was to be provided to increase the chances of salvaging the aircraft from the sea. When first flown by John Parker at the Isle of Grain on 27 May 1918, the first Shirl, N110, was fitted with a simple two-wheel undercarriage with V-struts and cross-axle, this being necessary to meet the test deadline, and when the aircraft was delivered to Martlesham Heath a few days later it carried a dummy Mark VIII torpedo which of course could not have been released with such an undercarriage. During the early tests the aircraft was found to be severely tail-heavy, and this appeared to be rectified by introducing wings with sweepback when N110 returned to Rochester. At about this time the original undercarriage was replaced by twin-wheel units, each pair of wheels being provided with a skid and attached to the lower wing by a pair of V-struts, thereby eliminating the cross-axle. A large inflatable flotation bag could be carried within each undercarriage structure. The second Shirl, N111, was delivered to Grain on 8 July and subsequently took part in torpedo dropping trials at East Fortune alongside the Blackburn Blackburd. It then went to Martlesham for Service performance and handling evaluation trials in August. In these, however, despite meeting the general performance and load requirements, the Shirl attracted criticism on account of sluggish handling characteristics, lacking the manoeuvrability of the Cuckoo, particularly during evasive action after releasing its torpedo. It was also found that, while carrying the torpedo, the aircraft was still excessively tail-heavy, and that, after releasing the torpedo, it became nose-heavy. 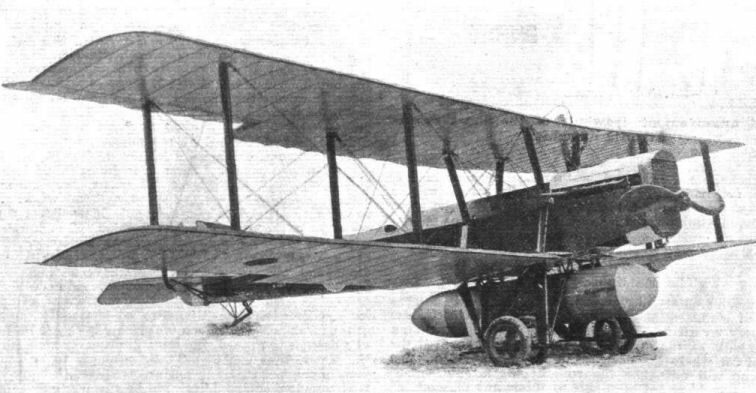 The third Shirl, N112, did not fly until December 1918 when, with the War over, the urgency for a new torpedo aircraft had largely disappeared, and official interest in the Shirl (and the Blackburn Blackburd) gave place to further production orders for the established Sopwith Cuckoo. (*) HMS Argus, 15,775 tons, had been begun in 1914 as a liner, Conte Rosso, for an Italian shipping company, but came to be launched in 1917 with a full-length flight deck, and was indeed completed in 1918. HMS Eagle, 22,600 tons, had been begun in 1913 as a dreadnought battleship, Almirante Cochrane for Chile; she was launched in 1918 but did not achieve full service with the Royal Navy until 1923. HMS Furious, 22,000 tons, the only other ship with a true flight deck, was eventually completed in 1917 with a flight deck forward of the superstructure (she had been laid down as a light battle cruiser in 1915); in 1917-18 an after deck was added, and between 1921 and 1925 she was fully converted to a flush-deck carrier). Type: Single-engine, single-seat, two-bay biplane torpedo bomber. Admiralty Specification: N I B (later RAF Type XXII). Manufacturer: Short Brothers, Rochester, Kent. Powerplant: One 375hp Rolls-Royce Eagle VIII twelve-cylinder, water-cooled, in-line engine driving two-blade propeller. Dimensions: Span, 52ft 0in; length, 35ft 0in; height, 13ft 3in; wing area, 791 sq ft. Weights (360hp Eagle VIII): Tare, 3,319 lb; all-up, 5,512 lb (with torpedo). Performance (360hp Eagle VIII; with torpedo): Max speed, 93 mph at 6,500ft; climb to 6,500ft, 17 min 30 sec; service ceiling, 10.000ft; endurance, 3 3/4 hr. Armament: One 1,423 lb 18in Mark VIII torpedo. No gun armament. Shirl. Like its counterpart the Blackburn Blackburd, the Shirl (1918) was a single-seat torpedo-carrier, designed specifically to operate with the 18-in Mk.VIII torpedo. Each of the two crutches was stayed by two inverted V-struts. 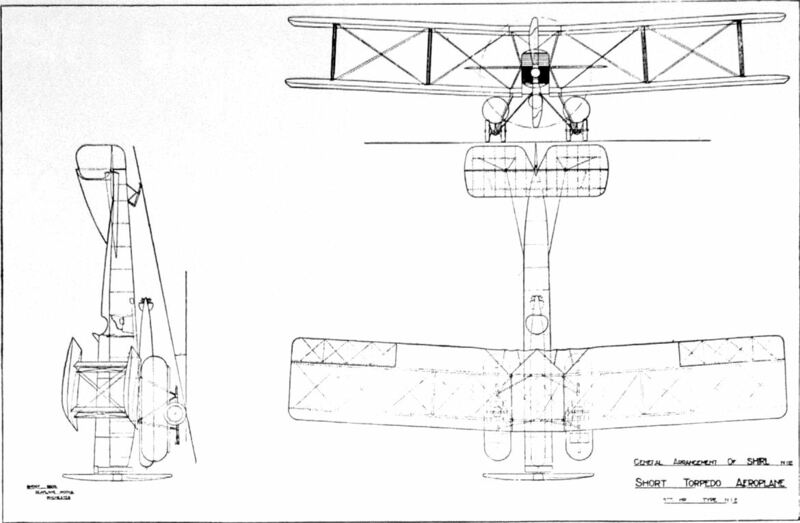 The Short "Shirl" biplane is generally similar to the N2B type seaplane except that a divided wheel and skid chassis is fitted for flying off decks and to allow the stowage of an 18 in. torpedo under the fuselage. The machine is a single-seater, the pilot being situated in rear of the main planes, which are noticeably swept back from the fuselage, and are arranged to fold for stowage on board ship. Flotation gear in the form of air-bags are carried over the skids and small plane form hydro vanes are fitted to the front of the skids, to prevent turning over when alighting on water. The machine entered by Messrs. Short Bros, for the trans-Atlantic flight is a modified " Shirl," fitted with somewhat larger wings and tailplane, and an immense petrol tank suspended under the fuselage. Name or type No. of machine "Short Shirl." Purpose for which intended Torpedo carrying. Gap, maximum and minimum 6 ft. Overall length 35 ft. 6 in. Chord 8 ft. upper; 7 ft. lower plane. Span of tail 15 ft. Maximum cross section of body 11 sq. ft.
Engine type and h.p. Rolls Eagle 8, 400 h.p. Weight of machine empty 2,850 lbs. Tank capacity In hours Max. 6 1/2 hours. Tank capacity in gallons 137 gallons. Speed low down 99 m.p.h. Speed at 10,000 feet 97 m.p.h. To 5,000 feet 13 minutes. To 10,000 feet 30 minutes. Total weight of machine loaded 5,950 lbs. THE preparations for the great race to be first to cross the Atlantic by air are progressing apace. By way of summary, the Sopwith machine, to be piloted by Mr. H. Hawker, who will have with him as navigator and assistant pilot Capt. Grieve, is already at the starting point in Newfoundland, and is only awaiting favourable weather conditions before making a start. The Martinsyde biplane, with its pilot, Mr. F. P. Raynham, and his navigator, Capt. Morgan, is on its way across, and may, by the time these lines appear in print, have arrived at St. John's. The Fairey machine, up till now the only seaplane entered from this side, is rapidly nearing completion, being, in fact, a standard Fairey 3C type especially adapted for the race. The pilot, as already announced, will be Mr. Sydney Pickles, so well knows to all readers of FLIGHT. The name of the navigator who will accompany him has not yet been disclosed, but will, we understand, be announced shortly. The Short machine entered, and which will be piloted by Major Wood, who will have with him as navigator Capt. Wyllie, has the distinction of being the only entrant which, so far, it is proposed to start from this side, the starting point chosen being Bawnmore, near Limerick, in Ireland. This machine, which has been undergoing severe tests during the last couple of weeks, is to be flown first to Ireland, whence the final start will be made. As to the probability of one or all of the competitors succeeding in getting across, there is of course, a certain element of luck involved, but arrangements, as announced elsewhere, are being made., by the Air Ministry and Admiralty, to take all possible precautions, and to ensure that, even in cases of engine failure, the occupants should have a very good chance of being picked up by passing vessels. As interest centres more and more in this race, a few words dealing with the British machines entered will, we feel sure be welcomed by readers of FLIGHT. Fundamentally the Short machine entered for the race does not differ greatly from their standard torpedo carrier known as the "Shirl." It is, as will be seen from the general arrangement drawings, a land machine fitted with wheels. In the place between the chassis struts usually occupied by the torpedo in the standard "Shirl" is slung a large cylindrical petrol tank which, should the necessity arise, can be quickly emptied so as to form a float of sufficient buoyancy to keep the machine afloat for a considerable period. In order to be able to carry the extra weight of fuel necessary for the long journey larger wings have been fitted, having three pairs of struts on each side instead of the two pairs fitted on the standard machine. A feature which is unique for this machine is the sweepback of the planes, which is very pronounced. This should form a very good feature by which to identify the Short machine, although from the fact that up to the present she is the only machine entered on which the westward flight will be attempted, she can scarcely be confused with any of the other entrants. As in the case of the Sopwith machine, the Short is fitted with a Rolls-Royce "Eagle," and the petrol capacity is, we understand, sufficient for a flight of 3,200 miles; in still air, of course. As the distance across is a little under 2,000 miles, this leaves a fair margin for adverse weather conditions, the prevailing winds in this part of the Atlantic being westerly at this time of the year. It will, therefore, be seen that the decision to make the westward flight may not be so dangerous as many are apt to imagine, and certainly considerable time will be saved by avoiding the delay of shipping the machine across before a start can be made. The cockpits are arranged in the usual fashion in this machine, i.e., in tandem. A directional wireless set will be fitted as well as all the navigation instruments of the usual type. The maximum speed is expected, to be about 95 m.p.h., but flying at cruising speed, and allowing for head winds, the actual speed may be expected to be considerably lower. THE TRANSATLANTIC ATTEMPT. - Three-quarter front view of the Short "Shirl." The machine with which this firm will make the attempt is very similar to the "Shirl," but differs in various details. For instance, the wings will be of greater area than those shown in the photograph. The engine is a Rolls-Royce "Eagle." General Arrangement of the Short "Shirl" Torpedo Ship Plane (375 h.p. "Eagle" Rolls-Royce engine). General arrangement drawings of the Short Trans-Atlantic machine.